Frequent readers of this site know of my fondness (well, let’s call it what it is – extreme fanaticism) for the genius of Walt Disney and the amazing “kingdom” that bears his name. Recently, I’ve been researching the early history of animation at Disney through various sources, mostly first-person accounts of the animators from the 1930s. When I had the opportunity, I also spent a few days in Anaheim, CA at Disneyland and Disney California Adventure. In a unique dining experience while talking with Cast Members, I was reminded again of the vision Walt Disney exercised to bring Snow White and the Seven Dwarfs to life. Tucked inside the entrance gates to Disney’s California Adventure is an iconic reproduction of the Carthay Circle Theater in Los Angeles. One of the most important theaters in the Golden Age of Movies during the Twenties and Thirties, it represents the premier of a tremendous achievement by Walt Disney – the first full length animated film, Snow White and the Seven Dwarfs. Though we now view Snow White and the Seven Dwarfs as an animation classic, in the mid-1930’s the idea of a full-length “cartoon” was unheard of. Walt Disney took one of the biggest risks of his career, putting almost all of his resources – both business and personal – into the film. Called “Disney’s Folly” by most of Hollywood (and more than a few inside Disney Studios itself), the film opened to critical and financial success, paving the way for Disney to continue expanding his creative genius. With critics becoming more vocal, Walt Disney knew he would have to inspire his team of artists and writers as never before. Walt approached a group of employees late one afternoon, gave each of them fifty cents, told them to grab dinner across the street and then return to the soundstage that evening. None had any idea of what Walt had in mind. When they arrived and took their seats on wooden tiers at the back of the room, Walt was standing at the front lit by a single spotlight in the otherwise dark space. Announcing that he was going to launch an animated feature, he told the story of Snow White, not just telling it but acting it out, assuming the character; mannerisms, putting on their voices, letting his audience visualize exactly what they would be seeing on the screen. He became Snow White and the wicked queen and the prince and each of the dwarfs. Along about the same time, Disney demonstrated his vision in another way. The new medium of television, though in its infancy, was growing. Before Walt Disney even understood the new medium of television, he still had the foresight to invest in it. Walt had learned from dealing with shady characters in the past to pay close attention to contracts. When his distribution deal with United Artists was coming to a close, he chose not to renew. UA was insisting on the television rights to all Disney cartoons. “I don’t know what television is, and I’m not going to sign away anything I don’t know about,” Walt said. He ended up signing with RKO Pictures in late 1935. Snow White and the Seven Dwarfs premiered in 1937, distributed by RKO Pictures. It was a smashing success, and was later given an honorary Academy Award for its groundbreaking achievements. It was no typical Oscar, either – the award instead was one statuette with seven miniature statuettes! Over a decade later, Walt’s interest in television began to develop. In 1948 he spent a week in New York with the specific purpose of watching and learning more about television. By the time he returned to the Studio, he was convinced it was just the forum to help promote his work. He even told Studio Nurse Hazel George, “Television is the coming thing.” While other movie studios were trying to think of ways to thwart the coming of television, Walt was gearing up to embrace it. By being the first studio producer to become involved with the fledgling medium of television, Disney was able to leverage that partnership into a financing arrangement that allowed him to bring another dream to reality – Disneyland. Walt had a grander vision of what his shows could do on ABC, and how they could be used to promote Disneyland. Despite pressure from the other studios, Walt and Roy Disney signed a contact with Leonard Goldenson of ABC, in which the network put up $500,000 in cash, guarantee $4.5 million in loans, and receive one-third ownership in Disneyland (which it later sold back to Disney). With the opening of Disneyland in 1955, Walt’s vision and imagination took on a reality that people could see, hear, and feel – an experience that changed entertainment forever. Walt Disney’s unique vision, personalized in the telling of Snow White, demonstrated in the far-reaching aspects of a contract, and brought to life at Disneyland, can be a model for church leaders today. When God wants change, He affects the heart of the leader first. To help people see the invisible, the leader must first understand how to unlock the imagination. How does the leader influence the imagination? Through metaphors, blended with the art of storytelling and question asking. If the leader has any hope of painting a memorable picture of the future, it will be with the vivid and compelling language of metaphor – living language – that penetrates the soul as much as it illumines the mind. What vision is burning inside of you, a vision that can captivate your team, influence the influential, and be brought to life in your community? Storytelling has played a vital role in our survival – allowing us to share information, knowledge, and values from generation to generation. Story is the medium through which we receive our early learning as to right and wrong, good versus evil, reward and punishment, social values, etc. We respond to storytelling. It engages our attention; no matter how old we get, who doesn’t love a good story? Understanding this, Walt Disney created a technique in the early days of his cartoon films that helped illustrate the flow and continuity of stories – the storyboard. 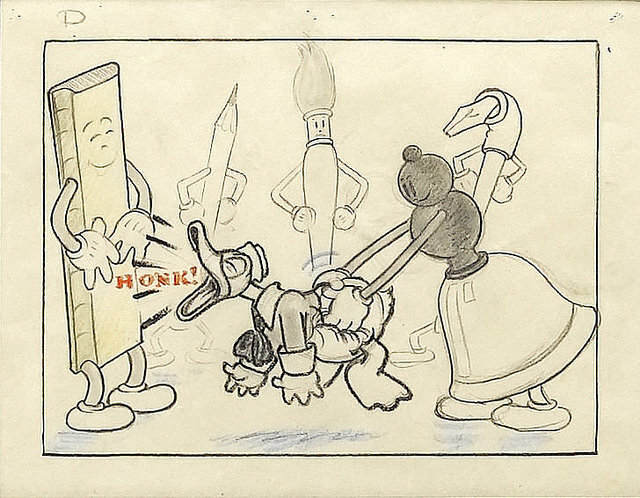 Storyboards are tools that allowed Walt and his artists to envision a film prior to production. It allowed his team to have a shared vision of the story they were telling and how it would unfold. As a bonus to driving the creative development, it also offered a cost-effective way to experiment with a film early on, so that when production began, costs could be minimized. Decades later, the tradition of storyboards continues on, though it has long expanded past just films. At Walt Disney Imagineering, rides, shows, and films for Disney’s theme parks around the world are the objects of regular storyboarding. Starting with brainstorm sessions, the Imagineer’s first thoughts, ideas, images, and feelings about the story they are creating are captured on note cards and quick sketches. The storyboards are worked, re-worked, rearranged, and edited until the story is strong and clear. Only then will production proceed. At Walt Disney Imagineering, everything they do revolves around the story – and storyboards have remained an essential tool in helping them tell the story. Let it start with words and images to single note cards pinned on wall. Step back and look at the story you are trying to tell. Rearrange, edit, and add to the cards. Work at it – hard – until the story is just like you want to tell it. An exceptional concept depends on good process as well as pure inspiration. One of my favorite shows at Walt Disney World’s Magic Kingdom is Mickey’s PhilharMagic. In the image below, notice the music notes in the background circling around the showcases in the gift shop at the exit from the theater. They’re not random. If you hum them, you will get the opening to Paul Dukas’ The Sorcerer’s Apprentice – one of the most memorable sights and sounds from Disney’s Fantasia, and the core idea in Mickey’s PhilharMagic. That’s the magic that “Process Practice” can produce! Being aware of the design process and knowing what phase the team and the idea are in is a big part of the show producer’s job. You probably aren’t a producer, but all leaders have a role in pulling various people and resources together in creating something – which is the role of a producer. Inspiration generates ideas, and the process helps to shape efforts in a way to keep the team moving towards a fully developed idea. Get going. Toss a bunch of ideas out. Direction often comes from joyous chaos. Get excited. Brainstorm. Dream. Take tangents. Notice where ideas go, what’s cool about them, and incorporate this into the design. Get committed. Set up a regular project meeting time, discuss ideas, or just sit and stare at the wall. Ideas will come either way. Get doughnuts or cookies and some toys. Brainstorming sessions go better when food or toys are around. Get different opinions. Listen to someone else’s point of view and listen for things that improve the design. Get confused. Ask yourself hard questions that you can’t answer. Get unstuck. Try a different direction. Throw out an impossible action. Debating a wrong answer can help reveal the correct one. Get your hands dirty. Build a rough model or stage a reading. You will learn more from this than from any debate, and you’ll learn it in time to fix things. Get reactions. Show the idea to others. Listen to what they say, especially if it isn’t what you want to hear. Get it on paper. Take everything you’ve learned and write a description of the goals and details of the design. If you write convincingly, you’ve probably got a good idea. If everyone is comfortable with the process, the team members have the freedom to generate the best ideas for their project.